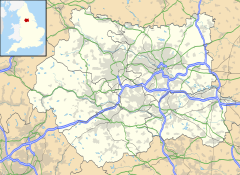 Fartown is a district of Huddersfield, West Yorkshire, England that starts 0.6 miles (1 km) north of the town centre. Fartown runs for approximately 1 mile (1.6 km) either side of the A641 main Huddersfield to Bradford Road. The district area stretches from the top of Woodhouse Hill to the Halifax Old Road with a population of 4,735 according to the 2001 Census. Fartown currently has a multi-ethnic population with a significant percentage of people hailing from South Asian and West Indian backgrounds. Two major hills are also situated in Fartown, Woodhouse Hill towards Sheepridge and York Avenue towards Cowcliffe. North Huddersfield Trust School is situated just off Woodhouse Hill. Huddersfield's Rugby League club Huddersfield RLFC played at the Fartown Ground as did the Yorkshire County Cricket Club. The ground there now is little used for sporting events. Fartown's name was cited as "hilarious" in the XFM radio show presented by Ricky Gervais in 2003. A house in Ashfield Street was used as the main family home in the British feature film Between Two Women. This page was last edited on 2 April 2017, at 04:26 (UTC).